In the bottom left corner of the dashboard choose Administration. Make sure that you are in the Regions & Users section and you should see a screen similar to the one below, showing all of your regions. Note that you'll only see the regions listed here if you have the "Manage Regions" permission as part of your security profile. On the Region you wish to create the new region under, click the icon. Once those are set, make sure you click "Save", in the upper left hand corner. Click "Close" to return to the Regions & Users Screen. Any product assumptions that were assigned to the parent region, will be the defaults in the child region, until you change them. Click on the name of the region you wish to edit.Then click the "Edit" button in the upper left hand corner. This will open the Region Edit Screen where you can edit all of the settings for this region. Once you are done editing you have three options. If you click "Save", your changes will be saved, to this region only. Any regions that are descendants of this region will not be affected. If you click "Save and Propagate to Child Regions", your changes will be saved to this region, and they will also become the settings of any regions listed as Descendant Regions, at the bottom of the page. If you click "Close", none of your changes will be saved. Click on the next to the region you would like to move. The following menu will open giving you the available regions that your selected region can be moved under. Select the region that you would like to be the new parent. When a region is moved, all of its users and settings are moved with it. The Root Region that is named after your institution, cannot be moved. All Users from the deleted region will be assigned to that region's parent. This dialog box will confirm what region that is and give the option to proceed or cancel. Once you click "Delete & Save" your selected region will be deleted and all sub-regions and users will be moved to the parent region. Any product assumptions that were assigned to the deleted region will be deleted and the products will use the assumptions of the parent region. 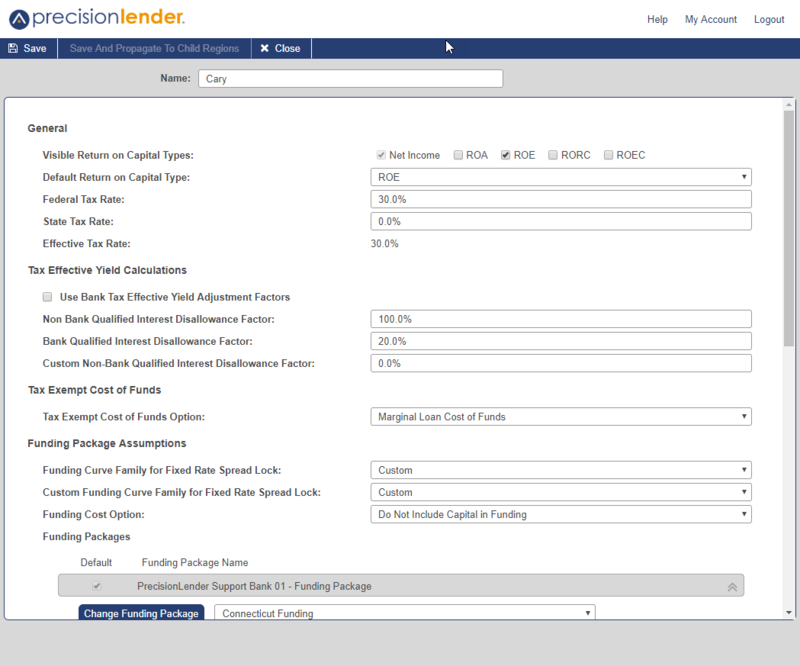 For any opportunity tied to a pricing region that has been deleted, the pricing region will be updated to the home region of the lender assigned to the opportunity. If the region you are deleting has sub-regions, these will not be deleted. They will be moved under the parent region.